Winnie the Pooh has gained the hearts of the kids with his cuteness. He became a favorite character which also paved way to various novelty items and toys with Pooh prints on them. Getting a stuffed toy that looks exactly like Pooh is like spending playtime with this honey-loving yellow bear. My daughter grew fondness for Pooh and wanted to play with him. So, I searched for Winnie the Pooh toys for her and I ended up with a Disney's Hug 'n' Wiggle Winnie the Pooh 11" Talking Plush. One look at it, you would think it is an ordinary stuffed toy that is just good for cuddling but no. There is more to this toy since it can talk and wiggle its nose once you press the tummy or once you hug it tight. My daughter loves its wiggling nose! We would put it near her nose too and she'll laugh hard. We would put it near her tummy and she'd burst into laughter 'coz she said it tickles. Aside from the nose wiggle, he talks and says words like, "Hello friends" and would laugh. This is perfect for babies and toddlers to make them aware of movements and sounds. But you have to squeeze harder on the tummy so it can talk and do the nose wiggle. This plush toy has a soft yellow fur-like covering so you don't have to worry about getting it near your baby or toddler. It can also sit on his own. You can just let him sit beside your kids during playtime. It needs three AA batteries which is placed at a box located at his back. It has an on/off switch so you can just turn it off when not in use. You don't want to hear him talk once you accidentally bump him! Overall, this Disney's Hug 'n' Wiggle Winnie the Pooh 11" Talking Plush is cute and adorable. This is one plush toy that will surely give joy to your kids. Let your kids experience the fun from this toy same as my daughter did. Disclosure: We personally bought the above item and is not compensated for the review. You can find an affliate link in this post. The author of this blog will be compensated once you purchase through the link. My daughter would love this! Thanks for sharing. Aaaaah! 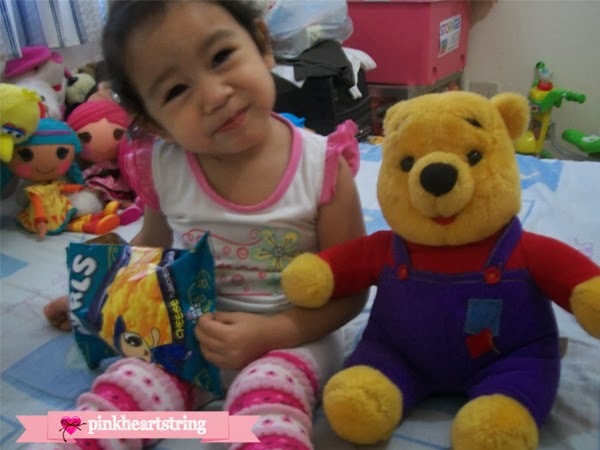 So cute, both your daughter and Winnie the Pooh! Aw, your daughter looks very happy with her new bear. Love Winnie the Pooh!